Fremo, has released the “Blue Point,” another impressive pioneering product, which perfectly combines batteries and Bluetooth headsets. 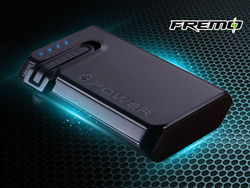 Fremo, a California-based technology company, has years of experiences in battery R&D and manufacturing. So far, it has successfully released many well-received external batteries, internal batteries, and Bluetooth headsets in North America. Now the “Blue Point”, another impressive pioneering product, has just arrived, which perfectly combines batteries and Bluetooth headsets. At the first glimpse, customers will be attracted by its innovative built-in Bluetooth design, which makes it outstanding when compared with competitors. The art of industrial design and technologies have been integrated to create an amazing product. Blue Point is the pioneer of this particular combination. The TI Plan Circuit Board is built inside to guarantee a high conversion rate and increase the ability to lock power. Blue Point applies the most mature CSR chip and EDR technology to build the core parts of the headset. Moreover, A2DP 1.2 is also supported. All the hard work makes high quality Hi-Fi voice communication possible. Blue Point creates a perfect storage plan for Bluetooth headset users. Users needn’t worry about whether they have lost Bluetooth headset or not. Blue Point offers a specially designed dock to keep the earphone safe and sound. What’s more, it can be charged automatically when users put it into the power bank. The 7800mah capacity ensures users 3.5 times iPhone 4s/5/5scharging,and 2 times more than the Samsung Galaxy S4.Get one Blue Point in hand and users will get one trouble free power bank on the go. And with a weight of only 180g, it is a smart and extremely easy product to carry anywhere. Speaking of compatibility, users needn’t worry about it. The Blue Point can work with almost any kind of tablet PC, smart phone, and even digital camera. What may need worry about though is whether or not users get right charging cable for the particular interface. The sales price is $42.99, while if customers apply the $5 coupon code: LMIXUIP2 on the Fremo Amazon shop: http://www.amazon.com/gp/product/B00MF8G4Z0, the discounted price will be $37.99. Please note that the coupon code is valid from 9/12/2014 through 9/28/2014.